Paella is a traditional dish of Spain that is typically prepared with rice, saffron, seafood, chicken, and Spanish chorizo sausage. I was inspired to make it when I came across a cute little bottle of saffron at the new Marshall's that recently opened out here by the Chenal Kroger. Marshall's is a department store known for selling a variety of discount items. At $7 for a .03 oz. portion of saffron, this product of Spain was indeed a great deal. The deep orange and yellow saffron threads are known to be the most expensive spice in the world. This is the spice that gives paella its signature flavor and color. Saffron is also the name of Edwina's daughter in Absoulutely Fabulous, a British sitcom that many of my friends love. 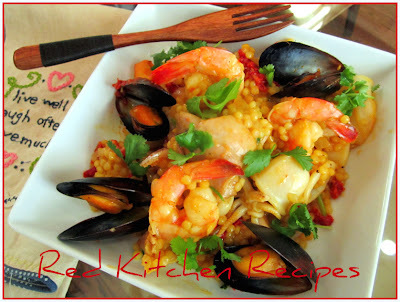 Instead of rice, I used Israeli, or Pearl Couscous to make my Paella. Regular couscous is actually smaller and has more of a grainy texture. I found this bag deep in the International section of Kroger Marketplace. It's actually much easier to find in The Fresh Market or Whole Foods. 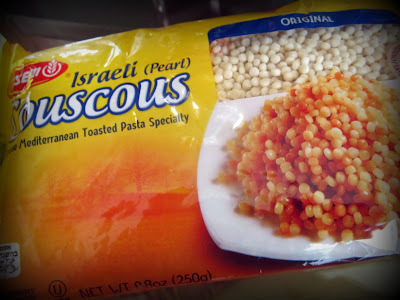 The back of the bag has instructions on toasting the couscous in light olive oil with diced onions before adding hot broth to it. I didn't have any chorizo, so I just used what I had in the house at the time. This was my first time to ever attempt this classic dish. The first time I ever had it was at Cafe Tapas, an old restaurant that we had in Little Rock so many years ago. It was at Breckenridge Village, and it was absolutely the best restaurant that I think we've ever had in Little Rock. I have so many memories of that place! Season the chicken with a spray of olive oil, paprika, garlic powder, and freshly ground pepper. Toss to coat. Cook in oven 30 minutes at 375 degrees. Cook the couscous. Heat a large dutch oven with a light film of olive oil, add the onions, then the garlic, and toast the couscous. When slightly browned, add 2 1/2 cups of hot chicken broth. Reserve the rest. Bring to a boil, reduce to low, and simmer while covered for 10 minutes. Heat the mussels in a separate, smaller dutch oven or saucepan. Heat over high heat, then cover and simmer on low heat for 5 minutes. Uncover and leave on low heat, stirring occasionally. After the couscous has absorbed all the liquid, add the calamari and shrimp. To the rest of the hot chicken broth, add the saffron threads. Toss both mixtures. Add the remaining broth to the couscous, then cut the cooked chicken into large chunks. Add the chicken. Toss until the calamari is opaque and the shrimp is orange. Add the cilantro and smoked, sundried tomatoes. 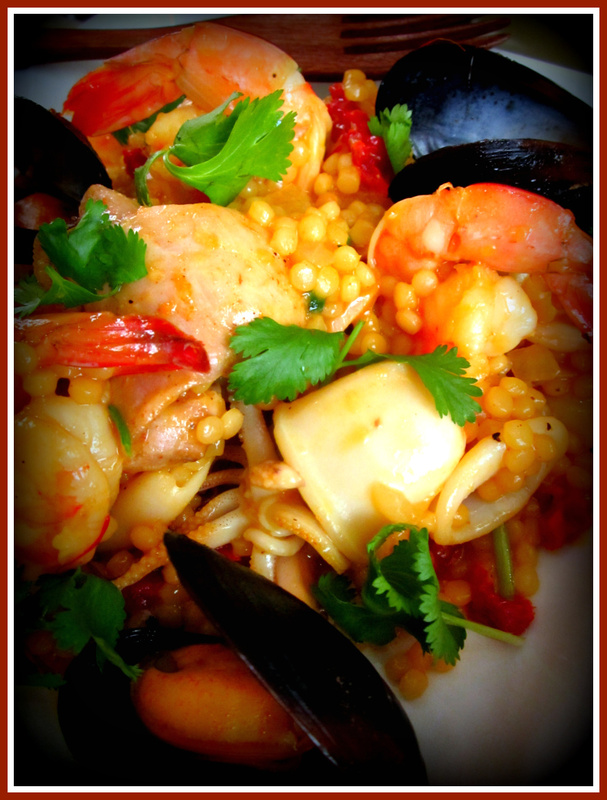 Serve by spooning the couscous mixture into a dish, add some mussels, and add broth from the mussels if you'd like. This may be the best thing I've ever made in the red kitchen. I think that my bestie Kristi may also agree! I'm so glad that she and Bailey were here to witness this delicious dish that somehow turned out so well...because that's what it's all about. Cooking for the ones you love. And I feel so fortunate to have some really wonderful people in my life.